1. 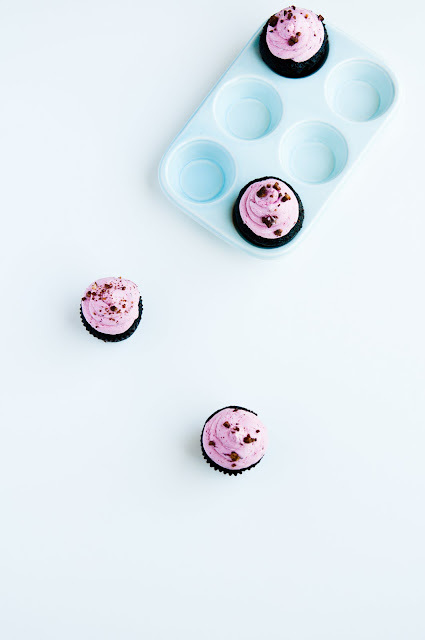 Preheat oven to 350 degrees F. Line the cupcake molds with cupcake liners and set aside. 2. In a mixer bowl, combine sugar, flour, black and Dutch-processed cocoa powders, espresso powder, salt, baking powder, and baking soda. Mix to combine. 4. Combine the boiling water and the instant coffee. Pour the hot coffee into the cake batter and mix on medium low until smooth, making sure to occasionally scrape the bottom of the bowl. 6. Bake for 15-20 minutes. 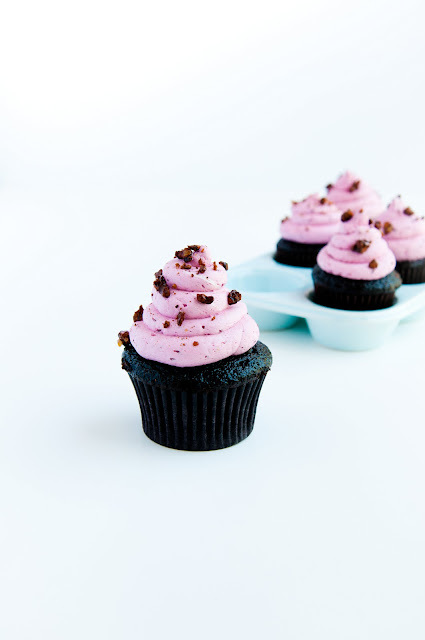 When a toothpick inserted at the center of the cupcake comes out cleanly, the cakes are done. Remove from the oven and let cool completely. 1. In a small bowl, mix together the olallieberry puree, creme de cassis, and lemon juice. Set aside. 2. Combine water and 11 oz (310 gr) sugar in a small pot over medium-high heat. Without stirring, bring to a boil and let cook until the temperature reaches 240 degrees F.
3. Meanwhile, place the egg whites and cream of tartar in a mixer bowl. With the whisk attachment, begin whisking the egg whites when the syrup begins to bubble on the stove. Start whisking on medium low until the whites begin to foam all over, then increase speed to high and gradually add the remainder of the sugar. Whip until soft peaks form and stop. 5. Continue whisking until the bowl of the mixer is at body temperature and not warm to the touch anymore. 7. Once all of the butter is incorporated, continue whisking while adding the olallieberry puree. Beat until incorporated. Use to pipe immediately. 1. Prepare a baking tray lined with a silpat or parchment paper. Set aside. 2. In a small, heavy-bottomed saucepan over medium heat, melt the sugar. 3. Once the sugar has completely melted, quickly add the cacao nibs. Stir and cook until the sugar turns a deep golden color (there might be a little bit of smoking--don't be alarmed!). Remove from heat immediately before the sugar burns and let the cacao nibs cool completely on the silpat, trying to separate them out as best as you can. 4. Once cool, crush the candied cacao nibs into small pieces. Use to top the cupcakes. Yum. I need to get myself some cocoa nibs. I love what you said about tailoring things to people's taste - it's such a pleasure. This look so good. I love your pictures. Thanks for share the recipes with us. 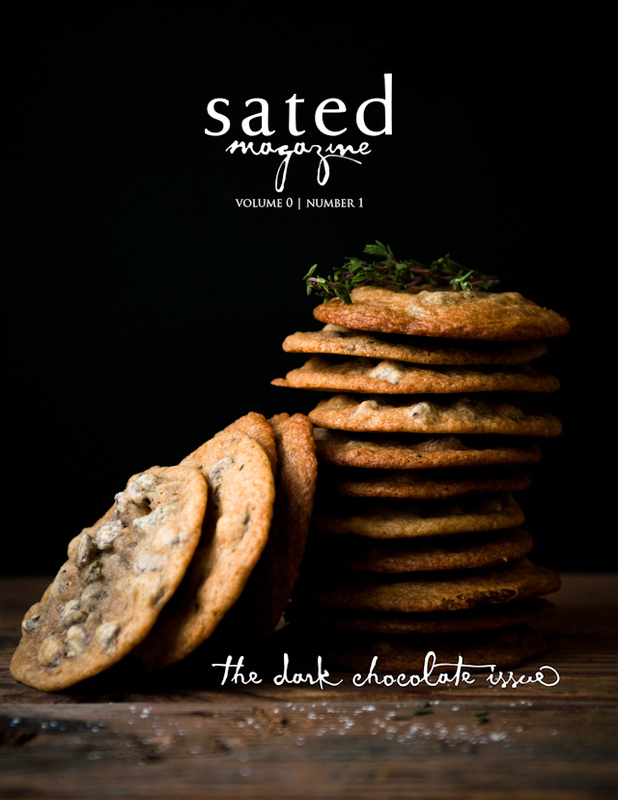 Wow, they are really dark - sinfully dark, yum! And I love, love, love the color of the icing. Gorgeous! gorgeous cupcakes! btw, are these the same as blackberries? they look quite similar..
@Patricia: I really like the way the icing color turned out, too--it's all natural, entirely from the berry! 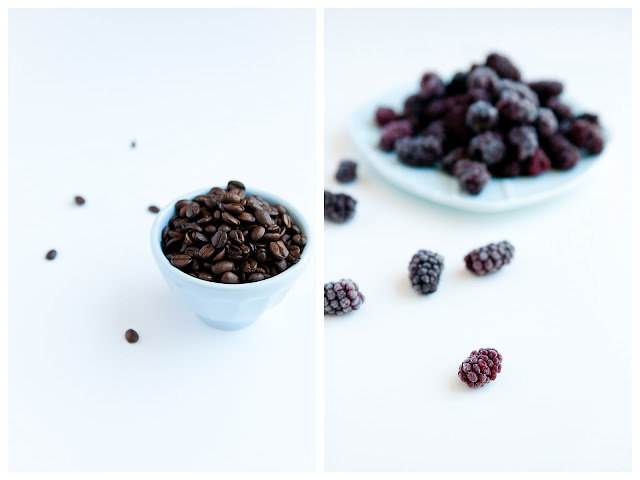 @Asha: Olallieberries are quite closely related to blackberries. I find them to be a little lighter and sweeter in flavor. Wikipedia, fwiw, has a pretty cool flow chart of which berry is related to which here. 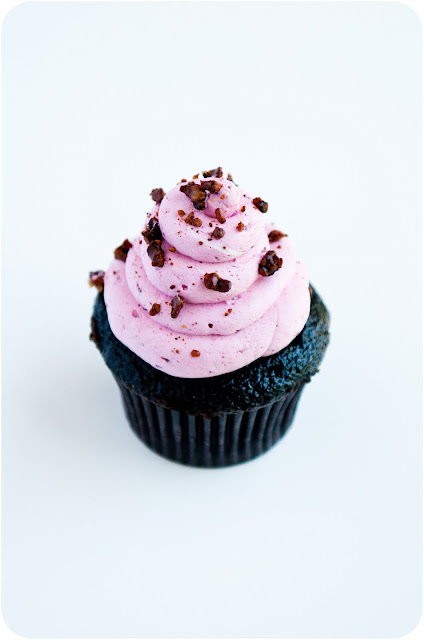 You had me at Cupcakes! Lovely photos, steph. 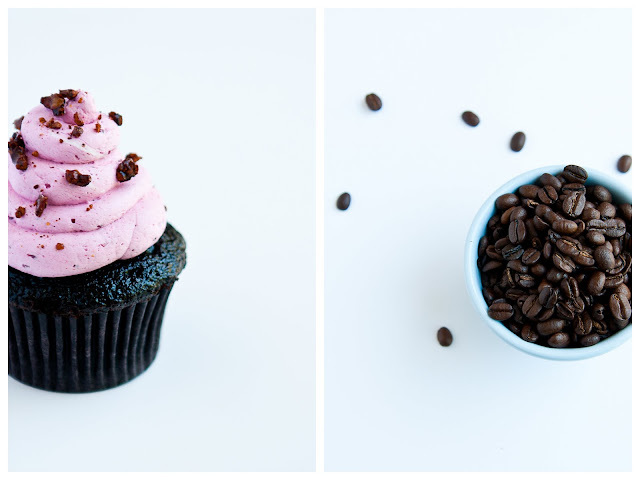 Especially the diptych with the cupcake and coffee beans. The candied cacao nibs sound amazing and that was very sweet of you to make these for them :). These look awesome! I mean really, REALLY awesome. I love the drama of black cocoa! And with candied cacao nibs?? I've never had olallieberries but I adore the name! 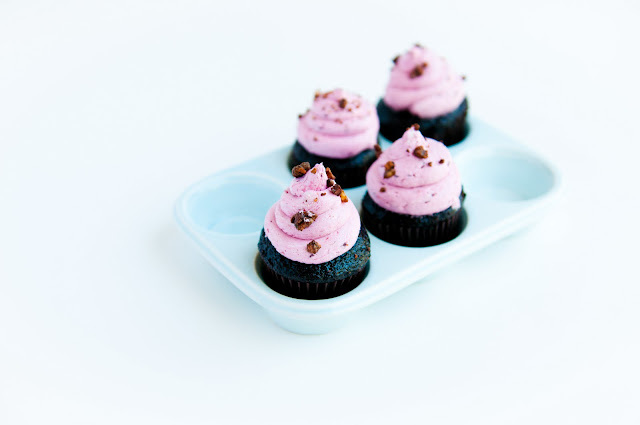 Bookmarking your site and i wanna bake your cuppies soon!! But i've not seen olallieberry before though. Perhaps i can substitute it blackberry? @anna: thanks! i think olallieberries is still a very west coast thing. i'm pretty sure they haven't spread eastward yet, which is really a shame! @maameemoomoo: thank you! you could definitely sub blackberries here, i think. after all, olallieberries and blackberries are very closely related. I have never heard of these berries, but they must be similar to blackberries...they look identical. 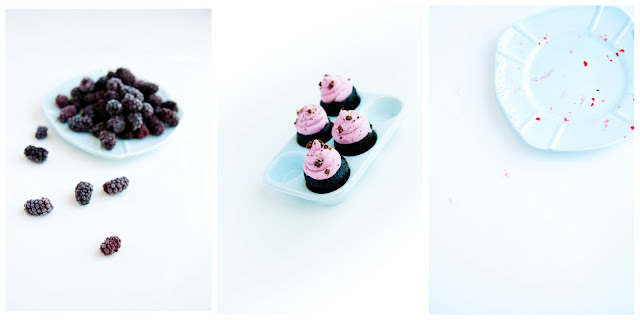 Whatever they are these cupcakes look divine! I loooooove dark chocolate cakes, so this is right up my alley! Hey, Steph! 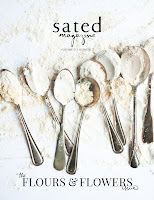 First time visiting your blog via Saveur (Congrats!!) and I'm so glad I did. Love it. These cupcakes are so hipster and classy all rolled into one. :-) The candied cocoa nibs at the end make it all work very nicely. Yum! !